Project Soli was first unveiled at Google I/O in May last year. Since that time we have heard and seen very little about the device, which is designed to enable new types of touchless interactions with our connected devices. 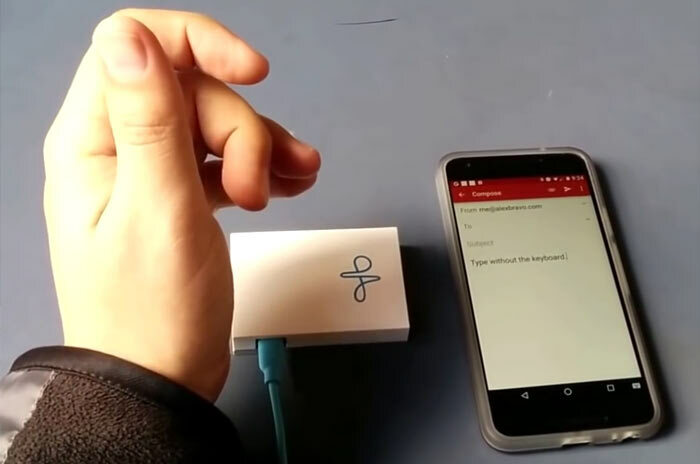 Recently Google started sending out development kits to testers and one of them has published a video demonstrating at least one compelling use for Project Soli – a touchless keyboard. First of all let's sum up what Project Soli is, and what it is designed for. The project seeks to address the user interaction challenge caused by the otherwise attractive tininess of wearables. People now are used to large touch screen devices so moving from these to a tiny sliver of a screen and a button or two, for example, is a jarring experience. Project Soli frees device interaction from a screen or similar surface to make the human hand, in the air, "a natural, intuitive interface for our devices". Google ATAP says that it can be produced at scale and made small enough to fit into wearable devices. The Soli sensor is said to be able to "track sub-millimetre motions at high speed and accuracy". Have a look at the official video above for an overview of how early test units work. As reported by Liliputing, a new video has just been published by one of the recipients of a Soli development kit. Engineer Alex Bravo likes to dabble in air-keyboards and has leveraged the Soli hardware to demo something he calls Soli-Type. In the video below you can see Bravo simply moving his fingers above the device to enter text into a smartphone app. This is just one of many potential applications for such a miniature sensing radar hardware project. Hopefully it can live up to expectations and provide some fluid, intuitive new ways of working with our connected devices, whether they have a big-touch screen available or not. But what about people with arthritis or similar afflictions? Might pose a challenge. But the technology itself is really cool. Technology does look good, I can imagine getting quite fatigued “typing” like that - couple of text messages and I'd be done! That's very cool. I'd love something like this coupled with an AR lens to display the results in front of my eyes. What crossed my mind though is a real air guitar.